The Monkees perform a sold-out show at Olympia Stadium in Detroit, Michigan. This week's edition of The New Musical Express reports that The Monkees will likely film an episode of their television series in Great Britain during their visit there in February. San Francisco hosts the first ever "Be-In" at Golden Gate Park, featuring live performances by Big Brother and the Holding Company, The Grateful Dead, Quicksilver Messenger Service and The Jefferson Airplane. Also in attendance … Hell's Angels. Billed as "The Human Be-In: A Gathering Of The Tribes", over 25,000 attend. It was here that Timothy Leary first proclaimed "Turn On, Tune In, Drop Out". Spotlighting the Haight-Ashbury area, Allen Ginsberg reportedly for the first time coined the term "Flower Power". Senator Everett McKinley Dirksen (from the great state of Illinois!) appears on The Hollywood Palace this evening, performing his surprise hit "Gallant Men", which currently sits at #33 on this week's Super Chart. The top premiers on this week's chart include "The Beat Goes On" by Sonny and Cher, the Motown classic "It Takes Two" by Marvin Gaye and Kim Weston and the garage band classic "The Little Black Egg" by The Nightcrawlers. Also new on the chart this week are a couple of middle-of-the-road / soft rock gems … "Tiny Bubbles" by the late, great Don Ho (#97) and "Then You Can Tell Me Goodbye" by The Casinos, one of my favorite songs of the whole year. Otis Redding ("Try A Little Tenderness") and Dino, Desi and Billy make appearances on "Where The Action Is". The Louisville, Kentucky, draft board refuses the exemption requested for Heavyweight Champion Muhammad Ali. The Seeds appear on "Where The Action Is", performing "Pushin' Too Hard". Big day in the recording studio today as Jimi Hendrix records the hard-rock classic "Purple Haze" and The Hollies lay down "On A Carousel". Keith and The Electric Prunes (singing "I Had Too Much To Dream Last Night") appear on "Where The Action Is". 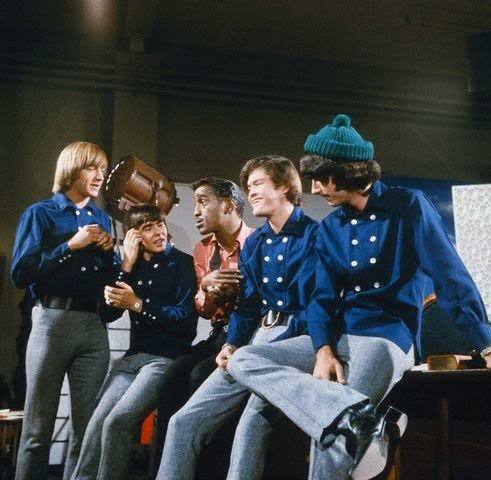 Sammy Davis, Jr., on the lot filming a guest appearance for the hit comedy "I Dream Of Jeannie", stops by The Monkees set, where they are filming the "Monkees A La Mode" episode. Although it is reported that Davis films a brief cameo, no footage of this appearance ever materializes. Neil Diamond performs "I Got The Feelin'" and "Cherry Cherry" on "Where The Action Is". 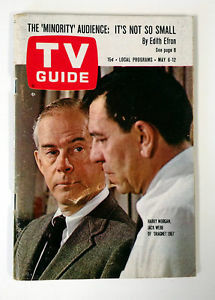 National Educational Television begins as PBS broadcasts for the very first time on 70 stations across the USA. It's a big day for Royal Weddings, too … Dutch Princess Margret marries Pieter van Vollenhoven. Elvis' new single "Indescribably Blue" / "Fools Fall In Love" is released. It will peak at #26 / #100 on the national charts … and go on to sell 300,000 copies, considered a failure by Elvis standards. The biggest movers on this week's chart include "Color My World" by Petula Clark, up another ten places to #22, "98.6" by Keith, now sitting at #26 (up from #37) and "Stand By Me" by Spyder Turner (#27, up from #41). 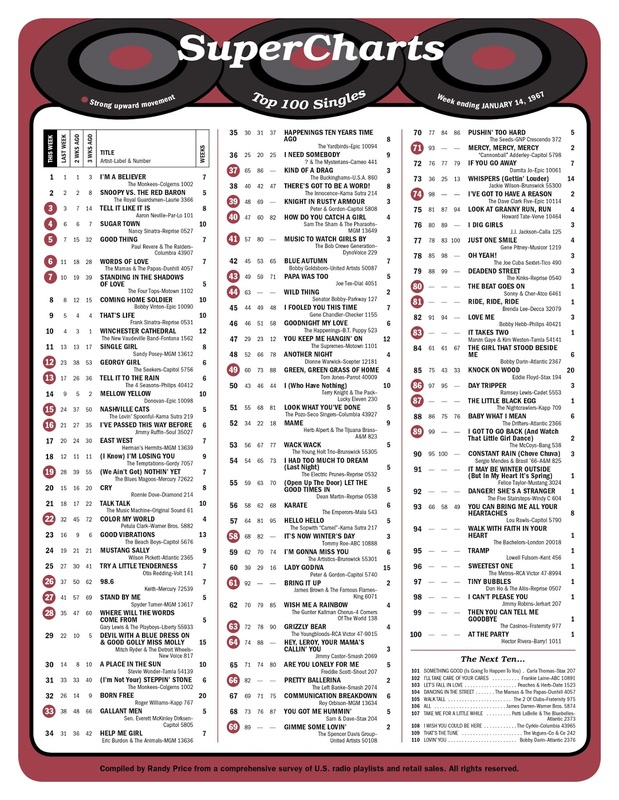 The Buckinghams make a HUGE leap into The Top 40 this week, climbing from #65 to #37 (that's a jump of nearly thirty places!) 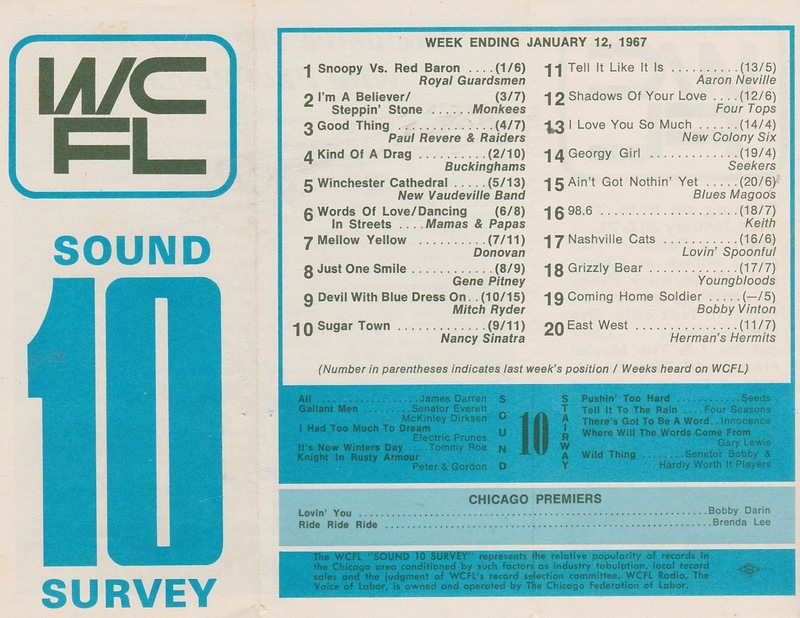 The Bob Crewe Generation ("Music To Watch Girls By"), "Wild Thing" by Senator Bobby and "Bring It Up" by James Brown (#61, up from #92 the week before) all make significant moves this week as well. The Buffalo Springfield appear on "Where The Action Is". The Monkees' second album, "More Of The Monkees", is released. In a few weeks it will displace their debut LP at the top of the national album sales chart. Later this evening, the episode "The Case Of The Missing Monkee" airs on NBC. "Steppin' Stone" is the featured song. New Orleans christens their brand new football franchise "The Saints"
Today is Elvis' 32nd birthday. We've got a brand new chart (for the week ending January 14th). As you can see, The Monkees hold at the #1 position with "I'm A Believer" (their third week on top.) The Mamas and the Papas sneak into The Top Ten with their latest, "Words Of Love" (up from #11 last week to #6 this week … the B-Side of that record, their remake of the Motown classic "Dancing In The Street" is "bubbling under this week at #104.) "Words Of Love" is the only new Top Ten entry on this week's chart. Meanwhile, The Monkees also have the #1 Album again this week as their debut album "The Monkees" holds down the top spot on the LP Chart for the tenth consecutive week.